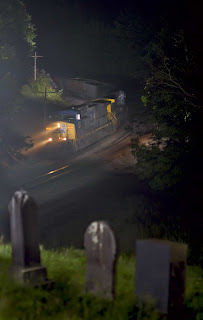 Advertised as the steepest portion of CSX' Mountain Subs' Cranberry Grade, at 2.84%, the aptly named Graveyard Curve forms the middle of a tight horseshoe curve east of Rodamer,W.VA. The graveyard contains headstones dating to the mid 1800's, (the stones I could read) and is reported to be the burial ground for many of the Irish immigrants who died while laboring to build this railroad through the West Virginia mountains. Reading the dates on the headstones, it's obvious life was much more precarious back in the mid 1800's. While the view looking downgrade at track level is impressive, this is, after all, Graveyard Curve, so up into the graveyard I went. What a view! The only lights to be seen at night are the stars & moon. 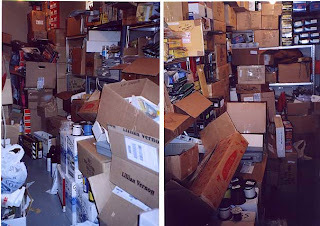 No orbs of light or ghosts drifting by, (no ghosts on the camera lcd monitor either.....thankfully). I did draw an owl in, with all the test flashes, landing overhead and suddenly "hooting". The CSX "Curved Track Gang" was working on Cranberry during the time I was here, and they had just laid new CWR and tie plates on the near main. While you hear eastbounds laboring uphill forever before they pass by, the only warning of a westbound is a whistle up in Terra Alta, then in a couple of minutes, the headlight starts to silently light up the area beyond the curve here, and the quiet running GE's come down around the curve at maybe 15 mph. The 2.84% grade is certainly evident in this view. 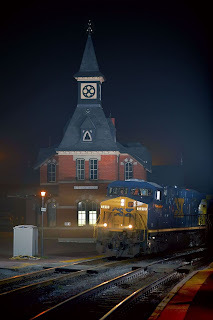 CSX 234 was shot at 03:58 on May 24, 2007 with the 5D, and Canons' 90/2.8 t/s lens, set at f2.8 with small amount of tilt down. Photo was cropped slightly from the 90mm view. From the platform in front of Point Of Rocks Station, here is the new look in CSX paint schemes, worn by a brand new ES44DC, the 5410. What a setting for a train to pass in front of! Shot on May 26, 2007 at 00:49 with the 5D, and Canons' 100/2 lens set at f2! I settled into the area around Brunswick, Maryland on May 25th. While at Point Of Rocks Station that evening, I saw two "Rock Runners" pass by eastbound, so I thought this would be a good opportunity to shoot one of them returning west here on the Winchester Sub at Harpers Ferry. After a four to five hour wait I was rewarded with the appearance of GP 38-2 2540. I attempted this same photo last year when visiting this location, and was not happy with the results. 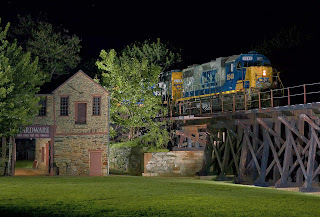 This is a very deceptive location to photograph a train on the trestle at night in. The tree throws a shadow across the long hood of the locomotive that you must deal with. I was much happier with the results from this visit on May 25th. See what you think. Shot with Canons' 5D and 90/2.8 t/s lens, tilted down one mark, set at f2.8, at 02:28. Flash units erased in ps that were in the alley and along the trestle. 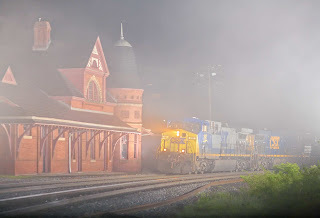 This photo was taken at Oakland, with the added enhancement of fog rolling in, I was fortunate to catch CSX 297 leading another westbound train of coal empties past the restored station. I spoke with one man when I was setting up here around 21:00, walking home with a six pack under his arm, and that was it all night. What a scene! A couple of eastbound loaded coal trains had rolled by in the intervening hours between photos, so I'm sure this westbound crew had been told of a night photo set-up here. I like this view looking through Canons' 100/2 lens. More impact. In processing, I have removed overhead wires and a flash unit on the platform just ahead of the plow of the 297. Shot on May 19, 2007 at 03:33 with Canons' great achievement, the 5D, (ISO 1600 & 1/200th). Please enjoy, comments are welcomed. Here's about half of my model railroad, maybe I should open a hobby shop instead!